Fish Plant: We did not plant any trout this week we will know sometime this coming week if it is okay to resume planting. Greyson Del Campo of Clayton caught 1 trout weighing 3.21 lbs. using power-bait at Sandy Point on 4-8-18. 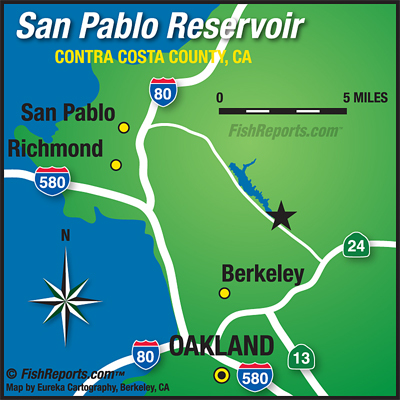 Carl Rayfield of San Pablo caught a trout at the Eagle's nest using power-bait on 4/10/18. Taney of Concord caught a 6 lb. trout using power-bait at Sandy Point on 4/10/18. Ivan Bandanay of Lafayette caught a 12.82 lb. catfish using power-bait at Sandy Point on 4/11/18. Ron Burrow of EI-Sobrante caught a 15.95 lb. catfish fishing down at the boat launch on 4/13/18. Max and Nate of Albany caught a 5.87 lb. Trout using power-bait fishing at the Oaks on 4/14/18. Jake Kramer of Suisun caught a 5.42 lb. catfish using a worm fishing off the handicapped dock on 4/14/18. Lucas no last name given caught a trout using worms at Sandy Point on 4/15/18.